Swamps, floodplain forests, rich woods, streambanks. This is a large, 12″ to 60″ tall, erect, perennial fern that rises from the above-ground crown of a vertical rhizome. The vertical rhizome produces numerous long-creeping, black, horizontal, underground runners (stolons) which root and give rise to new vertical rhizomes, producing new, genetically identical plants. Each plant produces two types of leaves (fronds), a dense spiral of several green, sterile fronds, with 1 or a few brown, fertile fronds in the center. 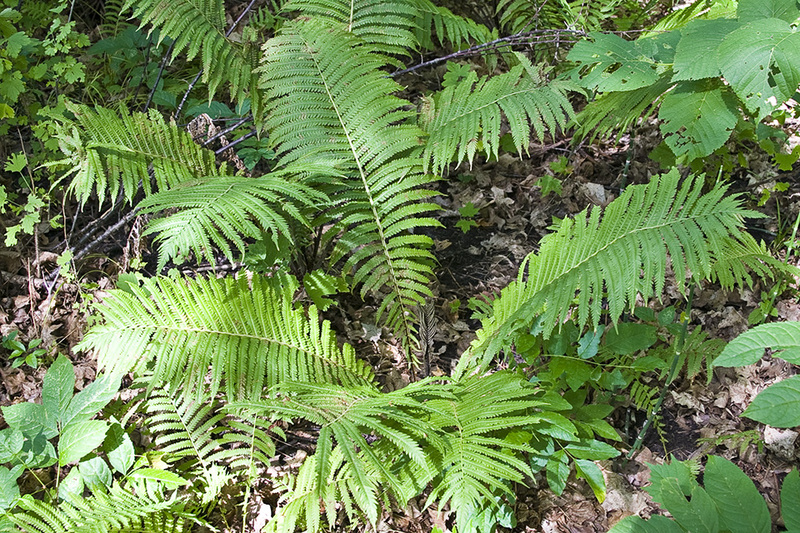 The smaller fertile fronds are sometimes hidden by the larger sterile fronds. 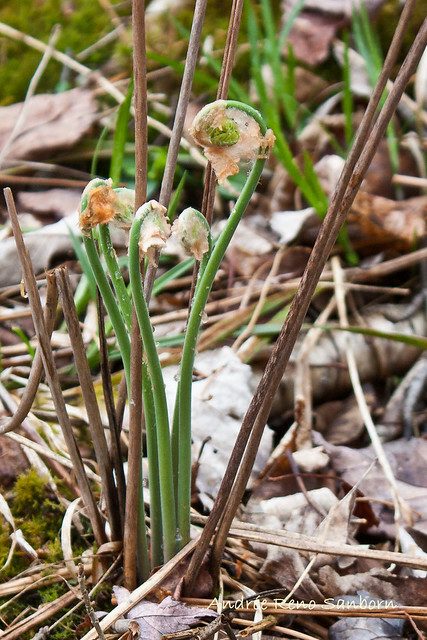 Less robust or unhealthy plants may not produce fertile fronds. 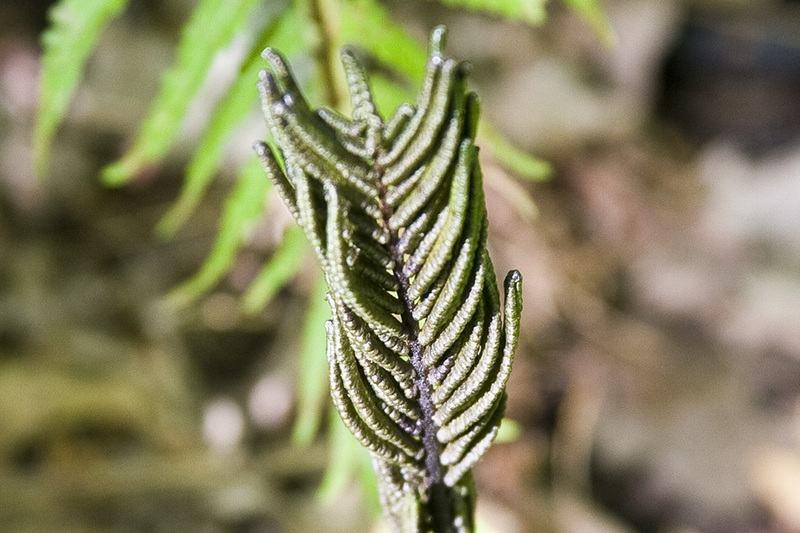 The sterile frond is erect and arching. The leaf stem (stipe) is dark brown or black, stout, and 1¾″ to 18″ long. It is much shorter than the leafy portion (blade), about 1 ⁄10 to 1 ⁄5 as long. It is flattened at the base and becomes deeply grooved above the middle. It is sparsely covered with pale orangish-brown scales. It is deciduous and dies with the onset of winter. The blades of the sterile fronds are inversely lance-shaped to inversely egg-shaped in outline, 12″ to 50″ long, and 4¾″ to 10″ wide. They are widest above the middle, taper quickly to the tip, and taper very gradually to the base. The overall appearance is similar to an ostrich feather, hence the common name. The blades are pinnately divided into 20 to 60 pairs of leaflets (pinnae). The central axis of the blade (rachis) is covered with white hairs. The pinnae are alternate, spreading, and linear. The longest pinnae are 2½″ to 5¼″ long, becoming shorter as they approach the base. The lowest pinnae are much shorter, as little as ⅜″ long. The pinnae do not have a tuft of cinnamon-brown hairs at the base. They are deeply, pinnately lobed, with 20 to 40 lobes per side. The upper surface is medium green and hairless. The lower surface is paler green and hairless. The lobes of the pinnae are alternate to almost opposite, broadly oblong, squared off at the base, and rounded at the tip. The veins visible on the underside of each lobe extend straight to the margin and are not forked. The margins of the lobes are untoothed and unlobed. 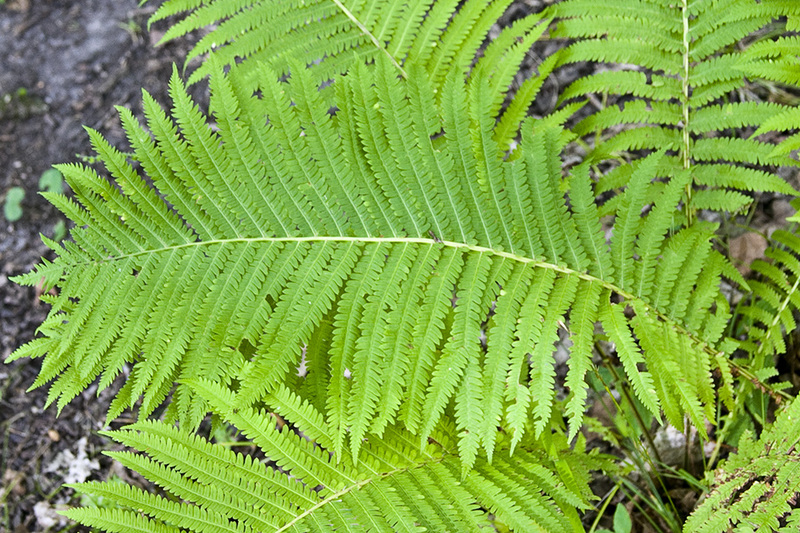 The fertile fronds are distinctive and unlike the sterile fronds. They appear on long stalks from July to October. 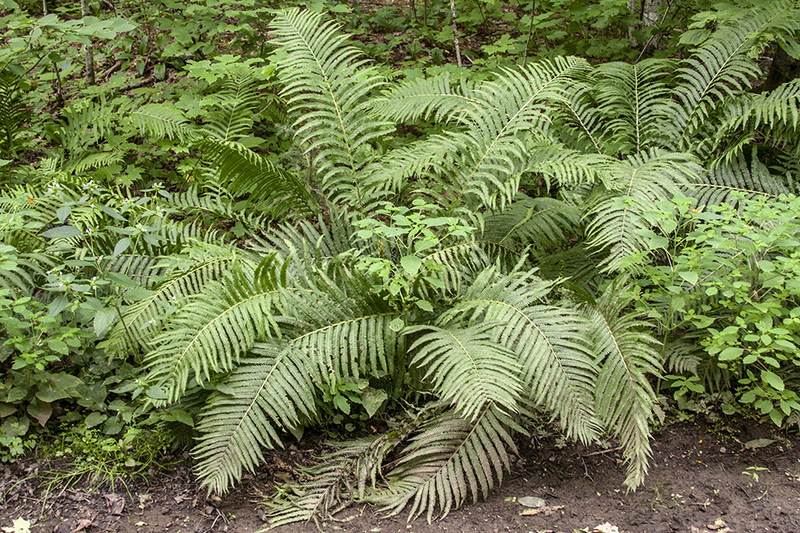 When they appear they are 10″ to 25½″ long, and 1″ to 2½″ wide, shorter than the sterile fronds. There are 30 to 45 greenish pinnae per side. The pinnae are ⅜″ to 2″ long, linear, and shallowly lobed. The lobes of the pinnae are curled tightly around the sori forming small bead-like structures. 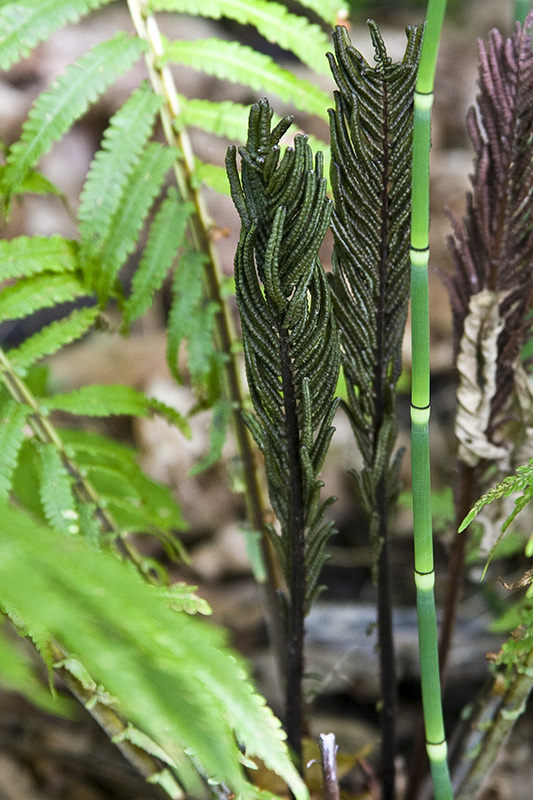 When they mature the fertile fronds turn dark brown. They persist through the following winter and release their spores in March and April. 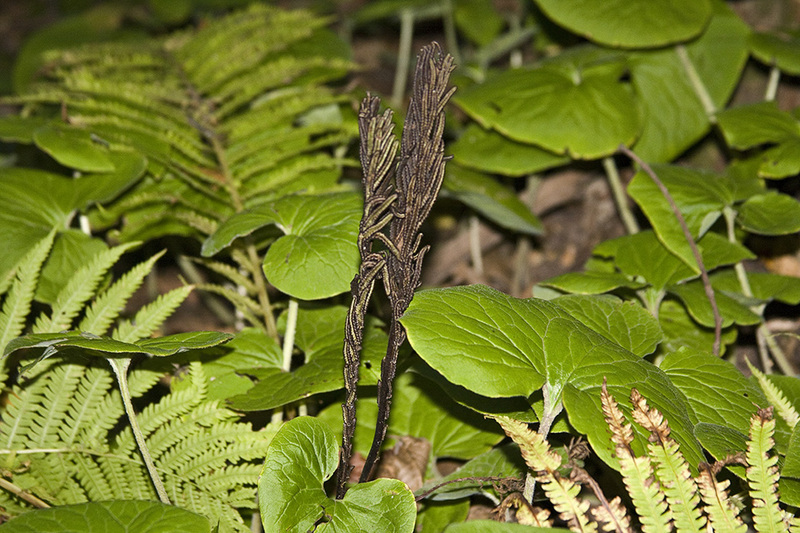 The above-ground, black, knob-like portion of the vertical rhizome, from which all fronds rise, the long-tapering blade, and the very short pinnae near the base of the blade are distinctive features of this plant. 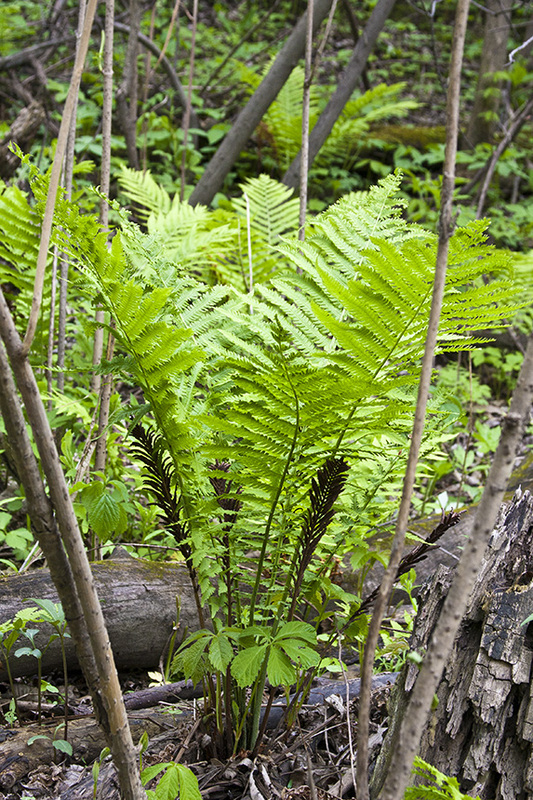 Cinnamon Fern (Osmunda cinnamomea) does not rise from a black, knob-like crown. There is a small tuft of cinnamon brown hairs where the base of each pinna attaches to the rachis. The veins on the underside of the pinnae lobes are forked 1 to 3 times. 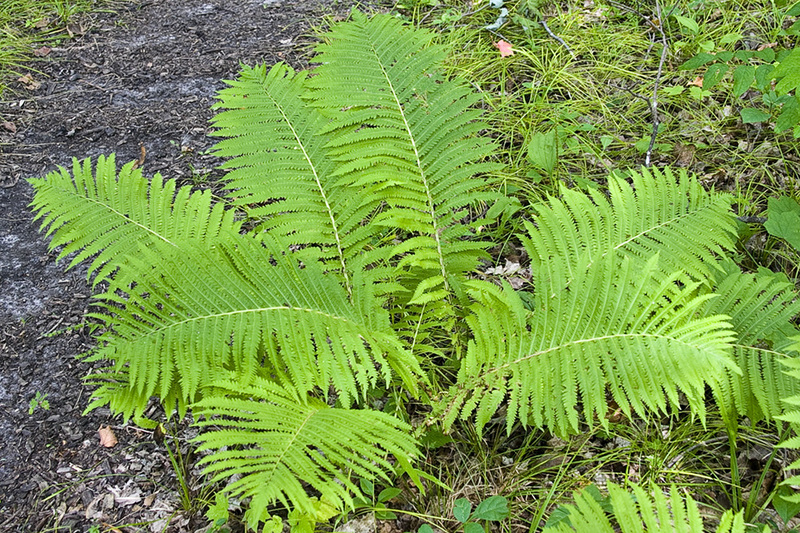 Interrupted Fern (Osmunda claytoniana) does not produce separate fertile fronds, the fertile pinnae being produced in the middle of otherwise sterile leaves. The veins on the underside of the pinnae lobes are forked once. This is the only species in the genus Matteuccia. A large leaf with many divisions: in ferns, the compound leaf, including the stipe and the blade; in mosses, a closely and regularly branched stem resembling a fern leaf; in lichens, a stalkless, leaf-like extension. 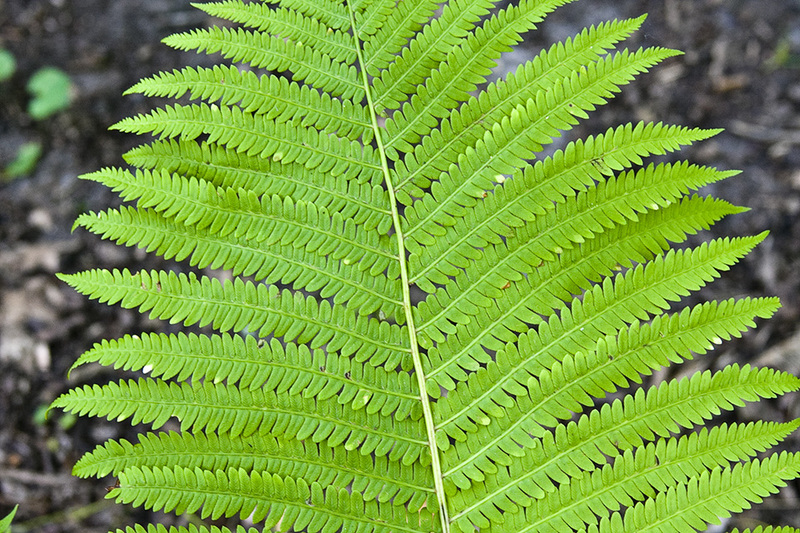 The primary division of a compound leaf or fern frond. The main axis of a compound leaf, appearing as an extension of the leaf stalk; the main axis of an inflorescence. A compact cluster of spore-bearing cases or sacs (sporangia) on a fern. A spore bearing structure, as of a fern or moss. La Matteuccie du printemps à l'automne. 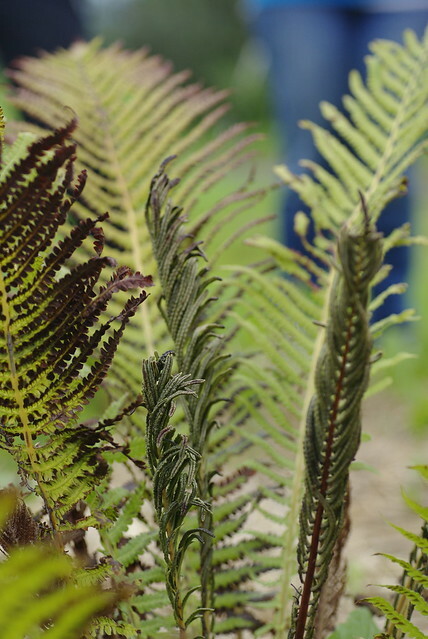 Ostrich Fern from spring to fall. Helecho Matteuccia Struthiopteris de la primavera hasta el otoño.